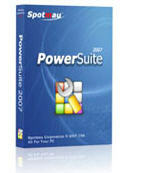 Spotmau PowerSuite 2008 includes ALL tools below and more. This all-in-one suite offers you a complete solution to solve all your computer problems in an easy way! It includes: WinCares, Password Recovery, Windows Install & Recovery, Data Recovery, Partition Genius, Disk Clone & Backup and Wipe Data. Optimize, clean and speed up system; Clean up history and protect privacy; Manage daily time and business schedule. Spotmau WinCares 2007 - Clean up history and protect privacy, restore IE, choose programs startup with Windows. Makes Windows faster, error free and more secure. Backup & Recovery your registry, partition or Windows. SpeedUpMyPC - Automatically fine-tunes all your resources including hardware, system settings and Internet usage to operate at peak performance at all times. Intelli HyperSpeed - help you optimize system by fixing programs caused by low memory, unnecessary background processes, junk registry, etc. MagicTweak - Optimize and personalize Microsoft Windows, tweak almost any aspect of system, optimize internet connection speed, control startup items, etc. Ashampoo WinOptimizer - Encrypt and decrypt files, join or split files, clean registry and system, such as redundant files of browser, unused Dll's, as a result optimizing your system. Registry Compressor - Optimize your Windows system by removing registry gaps and empty entries, and then compressing and defragmenting the registry file. Spot mau Data Recovery - It recover/transfer your important data when your Windows was crashed or the hard disk was formatted/damaged.